DIRECTIONS: Rt 208 North or South to Ewing Ave exit. Go to light and make a right onto Franklin Ave. Take Franklin Ave and make a right into Scott Plaza at the Wyckoff Municipal Complex. If you went over the railroad tracks, you went too far. 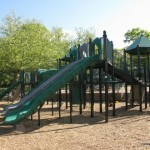 DESCRIPTION: A very large playground made up of two structures for each age group. The bright green equipment shines in the sun while a built in sand box sits in the shade. 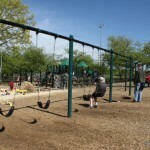 There are plenty of toys to play with and benches for mom to sit and watch. 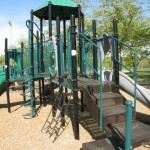 OTHER COOL STUFF: The playground is two-tiered with the little ones level to the parking lot with three steps to the larger play area. There is a steep triple slide looks like a lot of fun for three friends to race down. 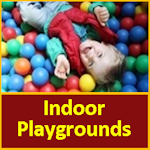 MAKE A DAY OF IT: As you leave the playground, make a right back onto Franklin Ave. there is a McDonalds and Starbucks in the Boulder Run shopping plaza which is over the railroad tracks on your left. Scott Plaza (back of Municipal Building) 340 Franklin Avenue, Wyckoff, NJ. 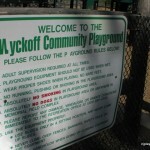 Ok, she was soooo not kidding, I have to say out of all the playgrounds I have visited, Wyckoff Community Playground has the most number of sand toys, that it’s almost impossible for your kid not to get his or her hands on a dump truck. 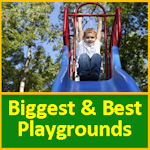 Our kids had lots of fun including the big sprawling playground structure with some really fast slides and climbing structures. Ice Cream truck stops here, and there are plenty of benches and swings. Bathroom is a the port-a-potty by the field. Thanks Jacqueline for your response, for a peek into what’s going on with this “Real Housewife of NJ” check out her twitter feed! More pictures below. 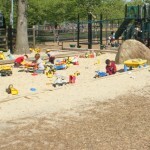 This was a great playground and there were tons of toys in the sand box. Fortunately I did not see any real housewives of New Jersey or I would have told them off for making it just a little more embarrassing to live in NJ. 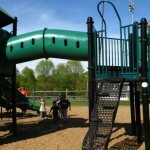 Great time at the playground. The sand box was amazing. The girls played there all day long.